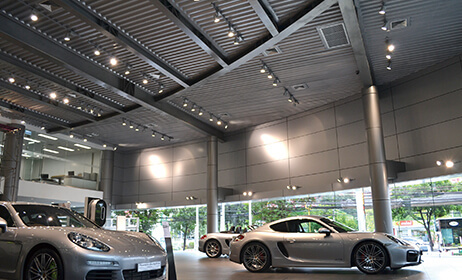 The appearance of light required for a car dealership showroom, for example, differs from that for a museum. In the past, lighting equipment would need to be changed in order to address individual applications, but with SALIOT, just one equipment can provide a variety of lighting presentations to match any situation. This is made possible by an industry-first* function enabling the light distribution angle (the angle at which light spreads) to be changed from 10° to 30° as desired. 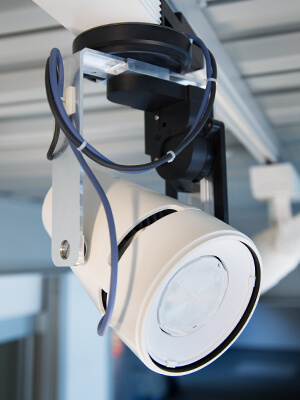 The positioning can also be freely changed with its pan and tilt function, a single equipment can be adjusted to provide lighting that perfectly suits any situation. If multiple SALIOT units are combined, the lighting of a space can be presented in an even wider variety of configurations. Furthermore, the color temperature and average color rendering index can also be selected to match any situation or mood. Presentation of a car dealership, implemented to accompany the announcement of new cars or seasonal events. Flexible adjustment of the light distribution angle can be instantly made from narrow (10°) to wide (30°). Functional light distribution designs using spotlights can demonstrate advanced “wall washer” effects where wall surfaces are lit gently and softly. 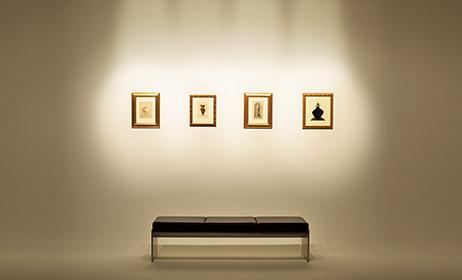 This can enhance the appeal of exhibits and displays. distance between the light-emitting diode and the lens is controlled by compact motors. These compact motors also control the unit’s pan and tilt functions. 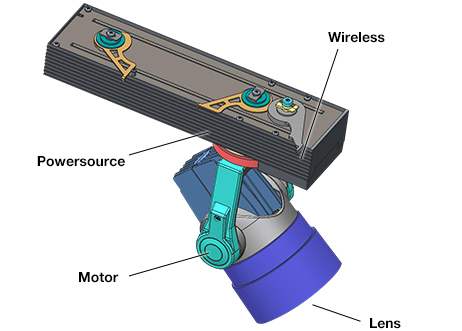 The lens and motors represent a fusion of optical technology and electronics devices only possible through Minebea’s vertical integration. This is one reason why it is able to create such highly-variable light. The name “SALIOT” was derived from the initial letters of “Smart Adjustable Light for the Internet Of Things”. The “IOT” part of its name includes one more innovative aspect of SALIOT: the ability to adjust lighting by remote control using wireless communication. In the past, if lighting mounted in high places required adjustment, work using a stepladder or adjusting rod was necessary. By equipping SALIOT with remote control functions using wireless communication, adjustments have been made simpler to perform and even more subtle adjustments can be carried out. This can help to realize improvements in work efficiency and reductions in operational costs. It is envisioned that at actual work sites, multiple SALIOT units will be operated over a wide area. Therefore, the Bluetooth® Smart CSRmesh™, which is currently receiving great attention as a leading-edge technology to achieve the “Internet of Things”, has been employed in its wireless technology. Operation from just a single smartphone can control up to 100 SALIOT units simultaneously. This operation can be conducted easily using a specialized application developed by our company, making it possible for detailed adjustments ranging from brightness, movement in the up, down, left, or right directions and changes in the light distribution angle, to be made. Minebea’s main occupation is the manufacturing of high-precision components, and SALIOT is one of our few complete products. For that reason, in order to make it suitable for the marketplace, not only did it have to offer high performance, but it also needed to be compact and well-designed. It is Minebea’s precision machining technology that has allowed us to simultaneously achieve these conflicting goals. 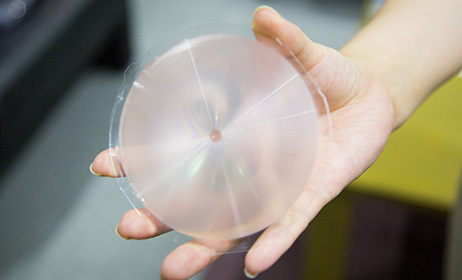 Using Minebea’s precision manufacturing technology, we were able to make the main components of SALIOT: the lens, motor, power source, and wireless, both high-precision and compact, and to cover it in a smart form. SALIOT is a composite product that combines the diverse components and technology of Minebea, from its optical technology of lens to its compact motors, power supply circuits, and wireless technology. Expert personnel from a variety of departments were involved in its development. In its initial development SALIOT was confronted by issues such as noise generated at the locations of the pan, tilt and zoom functions of the light. These were resolved by revising its design with cooperation from engineers in other departments. Minebea’s technology was fully applied to achieve visually attractive irradiated surfaces, using highly-advanced optical simulation technology, in the development of its zoom function. Our precision component and technology capabilities, and a corporate culture that facilitated cooperative efforts with other departments, gave birth to the innovative product known as SALIOT. We will continue to enrich its lineup with various additional models such as spotlight types and down light types, while uncovering new needs in the lighting industry.